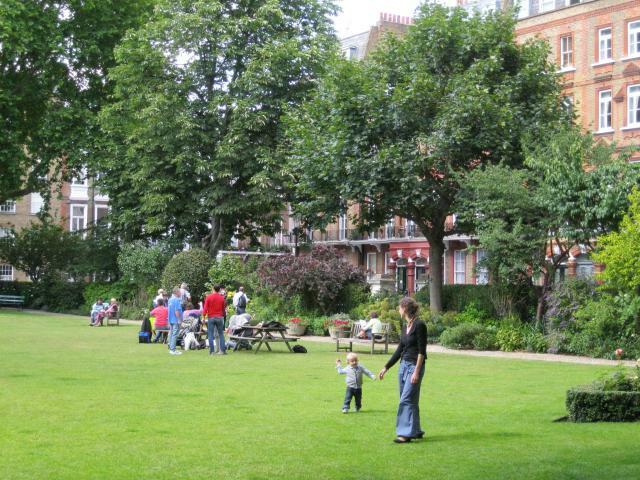 These private communal gardens were provided for the residents of Nevern Square, built in 1880-82 as part of the development of the Edwardes Estate. The garden was laid at an early stage of the development. William Edwardes, whose father had married into the Rich family who owned the Earl's Court Estate, had become Baron Kensington in 1776 and by the early C19th it was the largest estate in Kensington. The family's links with Pembrokeshire are reflected in street names, Nevern or Nanhyfer taken from a Welsh parish and river. The garden was purchased by local residents in 1974, who formed a non-profit-making company. Seven plane trees may have been part of the original planting, and the garden has a wide variety of trees. Has taken part in Open Garden Squares Weekend 17 times, most recently in 2017. Nevern Square is part of the Edwardes estate, in the early C19th the largest estate in Kensington consisting of 3 adjoining areas that together comprised c.250 acres. In 1721 the Earl's Court estate lands belonging to the Rich family, Earls of Warwick and Holland, were inherited by Elizabeth, aunt of Edward Henry Rich, who was married to Francis Edwardes of Haverfordwest in Pembrokeshire. Their third son William inherited the property here in 1738 and was later created Baron Kensington in 1776. The links with Pembrokeshire were further strengthened with his marriage to Elizabeth Warren of Longbridge, Pembrokeshire, and many of the street names reflect this when the Kensington estate was later developed; Nevern (Nanhyfer) comes from a Welsh parish and church taking the name from the river Nevern. However much of the estate remained agricultural until well into the C19th, with over 190 acres occupied by Earl's Court Farm, tenanted by the family of Samuel Hutchins from 1720, who lived in the Manor House. The relatively late development of the estate lands was partly due to the financial difficulties of the 2nd and 3rd Barons. The central garden today is framed on one side by yellow and red brick houses in the Queen Anne spirit, built between 1880-86; on the other side are subdued Italian villas with heavy paired porches. The square itself is lozenge shaped and wider to the north. The garden has 7 mature plane trees that may have formed part of the original planting, and among other trees are a wide variety including horse chestnut trees. A central lawn is surrounded by shrub and herbaceous borders. It is protected under the 1851 Garden Square Act. In 1974 Nevern Square Garden Ltd was established by local residents who purchased the freehold and took responsibility for the garden's maintenance. As a child in the early C20th the writer Compton Mackenzie lived at No.1 Nevern Square.